saute shallots, mushrooms, garlic in butter. Add spinach until it wilts, Salt and pepper to taste. Cut the tops off the pumpkins, scoop out the insides and sprinkle with salt and pepper. Fill the pumpkins with the mushroom veggie bread mix. Put pumpkin tops back on. Place pumpkins on a baking sheet with parchment paper, bake for about an hour. 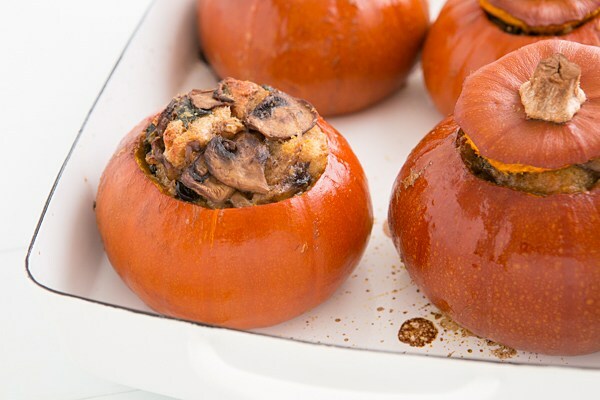 Remove tops and continue baking for 20 to 30 min, until the filling is brown and crispy and pumpkins are easily peirced with a knife.